The Hoover WindTunnel Air UH72400 weighs only 13 pounds and is one of the lightest Hoover bagless uprights available. The Hoover UH72400 introduces the first Hoover Steerable Vacuum with a swivel neck that allows you to easily maneuver the vacuum with little effort. New WindTunnel 3 technology allows the vacuum to remove embedded dirt and minimizes dirt blowback on carpets. Wind Tunnel 3 provides 3 channels of suction. The Hoover’s UH72400 Multi-Cyclonic action ensures no loss of suction, using eight cyclones engineered to keep filter-clogging dirt out of the airstream, to help the filter stay clean. The brush bar of the UH72400 shuts-off automatically turns off when the vacuum is put in upright position. Quick fit hose with one touch release for easy attachment to the hose for all of the included on board tools. The longer main hose is 14 feet long. For convenience, the power switch is located in the handle. Multi-Floor Brushroll On/Off: you can move from carpet to hardwood floors with a press of a button. The carry handle on the front of the vacuum makes it easier to transport the vacuum. Automatic height adjustment for vacuuming different carpet and floor heights. No scuff bumpers. Redesigned detachable handle and wand. Includes a long 30 foot power cord, and longer 5 year warranty. Vacuum Features: The UH72400 has a Multi-Cyclonic filtration system with a rinsable filter made of HEPA media which traps 99.97% of dirt, dust, and pollens down to 0.3 microns. The dirt cup releases from the bottom into your trash can. Tools Include: A 30-inch extension wand to extend your reach. Crevice Tool, Upholstery/ Dusting Brush. Hoover UH72400 Upright Vacuum Cord Length: 30 feet. Upright Vacuum Weight: 13 lbs. 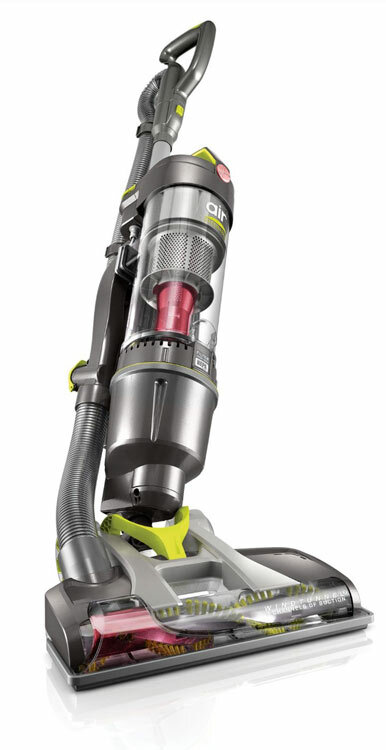 Smart-Review Commentary: The Hoover WindTunnel UH72400 is Hoover’s latest vacuum in the “AIR”series. Like the previous model, this is a lightweight bagless vacuum. New for this vacuum is swivel steering, which makes this a Steerable Vacuum for maneuvering the vacuum easily with little effort. Also new is WindTunnel 3 technology, giving you 3 channels of suction. It is an inexpensive model with many features that are in more expensive models, such as HEPA filtration, Multi-Cyclonic Action to prevent filter clogging, bottom emptying dust bin, and rinsable filter. This vacuum can recline to the floor, so you can reach under furniture. The long 14 foot hose can reach ceilings, fans, and higher objects. No scuff bumbers protect your furniture. For convenience the Multi-Floor Brushroll On/Off Feature allows you to turn off or on the brushroll with the press of a button. Hoover has extended the warranty from 2 years on the previous model to 5 years on the UH72400. This model has received excellent reviews by consumers and is a Smart-Review top pick and a great value for an upright vacuum.